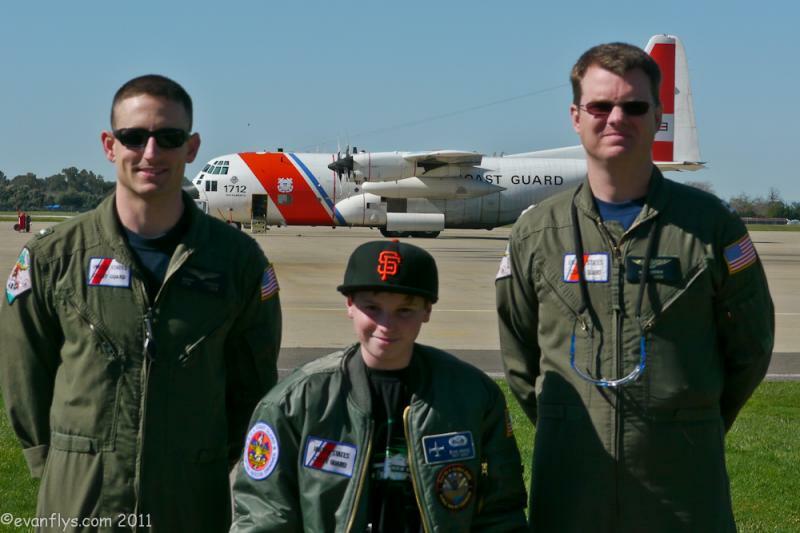 LT Matt Botnen and LTJG Kevan Hanson fly the amazing C-130 Hercules for the United States Coast Guard. I was very fortunate to be able to visit with them at USCG Air Station Sacramento and after an incredible tour of the station, I got to sit down with them and have a really fun interview. Here it is! Were you guys interested in flying as kids? Matt: Absolutely. Growing up, my dad was an Army helicopter pilot; a two tours in Vietnam kind of guy, so I grew up around helicopters in the Army. My whole childhood I wanted to fly Army helicopters. That's all I ever thought about, so I tried to focus things my way, took some detours so I could do what I wanted to do and eventually I did get to do it. Obviously at some point I swapped over to the Coast Guard and went on from there but as a kid it was foremost in my mind and it continues! My grandpa was a pilot, my dad was a pilot and my son; that's all he thinks about night and day as well and I don't know if it's heredity but once you get the flying in your blood you just can't get rid of it. Kevin: And for me I was kind of on the same boat as you are. I didn’t have any family background but my parents took me to air shows when I was a little kid and as soon as I saw those planes flying around I was hooked. But as you grow up you find other interests and I was really digging the sports in high school and I went to the Coast Guard Academy because I was recruited there for sports but I kind of re-found my desire to fly and flying from the Coast Guard is as cool as it gets; if you ask us or any of us here. So yeah it's been something I’ve wanted to do since I was a little kid. So why did you switch over into the Coast Guard, Matt? Matt: I had been in the Army for about 12 years before I switched over. I was flying Hueys and eventually Blackhawks in the Army and I was having a great time. To be honest, I love the helicopter mission. Flying low and fast over the trees, but there was a lot of time away from family. In my single days I didn't mind and being married without kids was still a great time but once my kids were born, being gone a lot of time was really tough especially when I would come home and my kids are missing me and “Sorry!” a week later I would have to go away again and it happened more than once. My kids were having issues with it and I started looking to other places where I could continue flying but not have such a negative impact on my family. So I started looking and I came across the Coast Guard through a weird series of events where a buddy of mine who was also an Army pilot went over to the Coast Guard and told me about how he got picked up. I feared I didn't have much of a chance because I've been in the Army for 12 years so I called up the Coast Guard and told them my credentials and experience and we were looking at things I've done and they said “Do this packet.” So I did and I switched all before 9/11 and all those things have happened since then, so it's kind of weird in a way. Before I made the switch, I was in a service that at that point was always training to do a mission. The mission itself wasn't there, and I looked at the Coast Guard and there was an organization that was doing their mission; they're actually out there saving lives that they were training to do and of course I switched over to the Coast Guard and within a year of me switching over 9/11 happened and the tables turned. Now the Army was going to go out and doing what they’re training for and all my brothers that I trained with are now going to have to go do it and they're doing it without me. I felt bad for a little bit but the Coast Guard has a great post-9/11 mission as well. We kind of embrace that and I found myself still fighting the good fight and doing a lot of great things in the Coast Guard. I'm happy I made the switch and it's great now as far as as law enforcement, saving lives, flying helicopters and now the C-130's a lot of fun too. 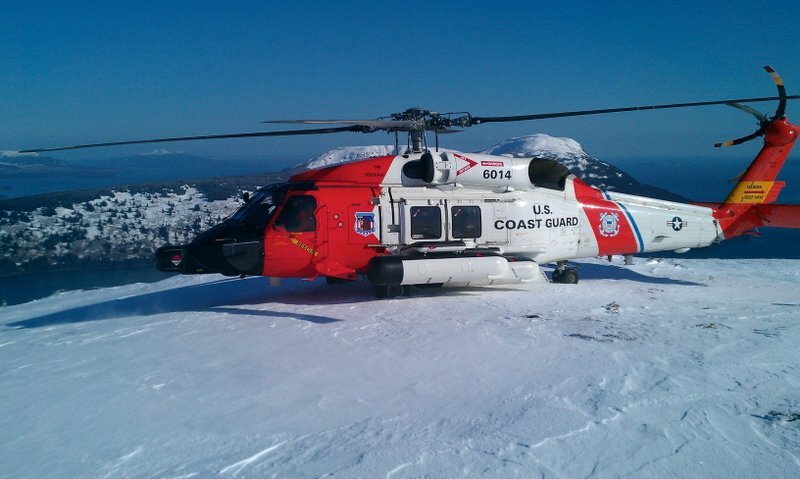 Kevin: For me a lot of Coast Guard pilots have a similar background. You're flying in another service first or flying a different aircraft and then heard about the Coast Guard, seems a great idea; I want to do that. I guess I got lucky and made the right decision right off the bat and I actually cam in after 9/11. I was in high school when that happened, so that was definitely a life-changing event for everyone to the country in a definitely played a part in motivation for joining the Coast Guard and serve your country. So I went up to the Coast Guard Academy and I didn't really know too much about the Coast Guard before I joined. I just thought that I would give it a shot and once I learned more about the missions that they do and the opportunities available for flying I was hooked. I'm thinking about joining the Coast Guard when I'm old enough. Do you guys have any advice for me? Matt: I think Kevin would give you the best advice. My way to the Coast Guard was rather convoluted although I'll tell you; my son, he also wants to be a pilot and the Coast Guard is maybe the way I want to do it and I'm constantly telling him stay in the books and study. You want to get the Coast Guard Academy you have to stay on top of things. Of course, he knows my background so he throws that at me real quick. “I don't have to join the Coast Guard! I'll just join the Army and if worse comes to worst I'll just switch over later.” But so many things had to happen in order for me to do that. You can't rely on timing like that, so my advice would be if that's the end result, that's what you want to be, then you should study and hit the books and do as well as you can in school and make yourself as good a fit in the Coast Guard Academy as you can and make your dream come true. Give yourself as much of a chance of getting into the Coast Guard Academy as you can and obviously here's someone who did it that way so he can tell you everything he did. Kevin: Matt really hit the nail on the head there. It's a lot harder for young kids these days to have a vision of the future path but your time in middle school and high school and college is huge; that's where you're setting up the basics for your future success in life so that education is a huge part. Do good on the standardized testing and everything and the other aspect is you can't be just smart or studious you have to be a well-rounded person, you got to be balanced in all the aspects. Community service, helping other people, things like that, leadership stuff. I did a lot of sports and interacting with other people so in a C-130, the basic crew is seven people so you're in a tight little community on a platform during your mission so as a pilot you have to be a leader of that crew so sports and organization sets you up really well for that kind of thing. But yeah, timing is everything so you should take the steps to do everything you can and put yourself in a position. Things may not always work out as you planned but you'll be in a good spot to have the opportunities that are available for yourself. Can you guys tell me what it's like flying a C-130? 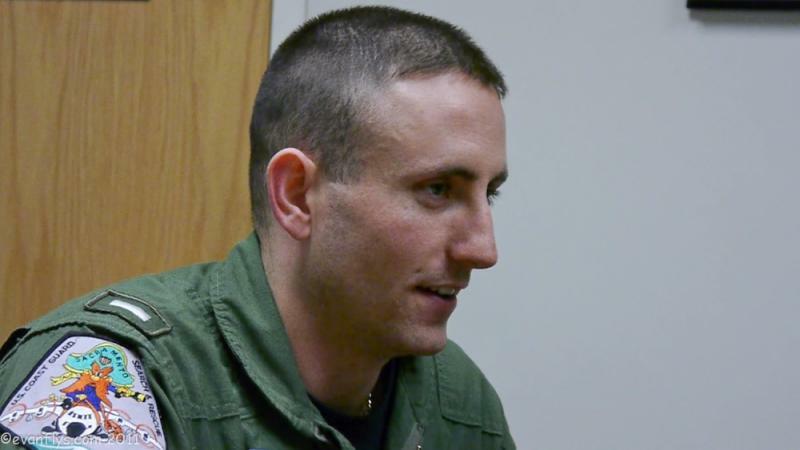 Matt:The C-130 is definitely an interesting airplane from my perspective of coming again from helicopters. It is big and fast and it quickly moves across the ground getting from point A to point B, but it's maneuvering is a bit slow and sluggish. If you want to change direction suddenly; like I wanted go right there and I want to do it now, you have to plan ahead. It takes a lot to get that thing around and get it going. It's interesting in that dynamic. 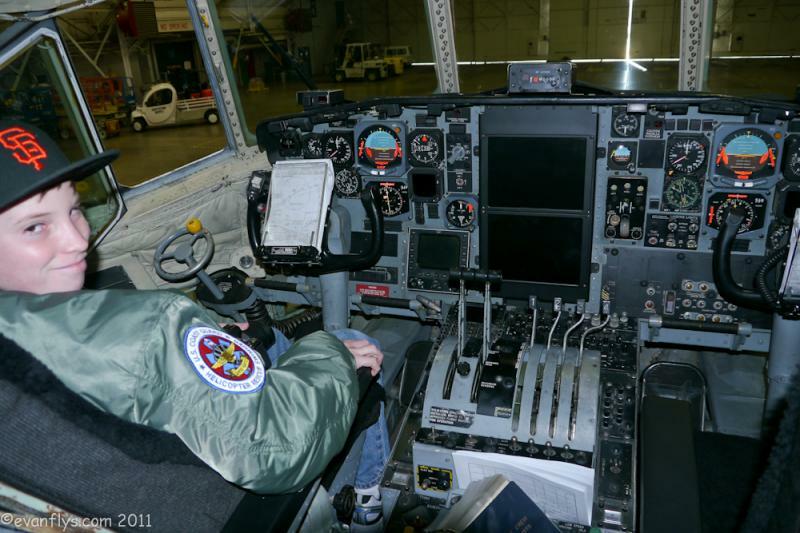 When I first made the switch, I had flown HH-60s in Kodiak, Alaska, for years and the switch to the C-130 up there and all the standard places in the 60 would take me six or eight hours to get to, completely bagging me out. “Bagging Out” means that over a certain amount of time you're not allowed to fly anymore. It's basically after this much amount of time, they determine if you should continue flying or you're too tired and fatigued and when that happens we call that bagging out. There were various places where SAR (Search And Rescue) cases would typically occur, and it would always take two HH-60 crews because one crew would fly there and then the C-130 would fly another crew there because the first one is bagged out and so the second crew flies back the case, and so here I'm going from Kodiak to St. Paul Island; that's a good 6 hour flight, but when you hop in the Herc it's 2 – 2 and a half hours and you're like “Oh my gosh I got here so quick!”, so really enjoyed that aspect and when you're on the patrols and the helicopter you're like “Oh I see that boat there, let's get the numbers off the boat.” In a helicopter, you just pull back, do a decelerating turn and boom you read the numbers off the back. It happens that quick, and you're off to the next boat. But in a C-130 it's like”Hey there's a boat, let's get the numbers off it” so you get all configured around, it takes you a couple minutes and do one pass as slow as you can get it and you're like “Did everyone get the numbers?” “I think I got half of them” so let me take another 5 minutes to get it around and do it again, it's a much broader process to get the things done, and you definitely fly the things very differently. And the crude aspect of it is very different too like Kevin brought up earlier, it's a crew of 7 in the Herc; it's like you have a whole town in there with you there is lots of crew dynamics, it's a real crew resource management challenge as opposed the helicopter crew where it's just the flight mechanic and the rescue swimmer back there; a very small crew. When you hear a voice you know who it was who talked, as opposed to a Herc where sometimes it can get kinda confusing, like who’s speaking up. But also on the ground and you're trying to find out post mission-type of perspective; trying to get information from six other individuals instead of three can sometimes be a challenge but all in all the C-130 is very fun and it's complex and there's lots of new systems to learn. It makes it challenging to be in such an big airplane and make it do what you want but I enjoy flying it in a lot of different ways but it definitely isn't the little sports car mentality like the other airframes have and that's my perspective. Kevin: I haven't flown a helicopter so I haven't had that comparison to base it off of but a lot of guys coming in to the Coast Guard, that's what they want to do; fly the helicopters. You're the one picking up people out of the water and it's awesome, it's an exciting job, but at the same time you have some very critical missions that we do too and they're very exciting you do as well. 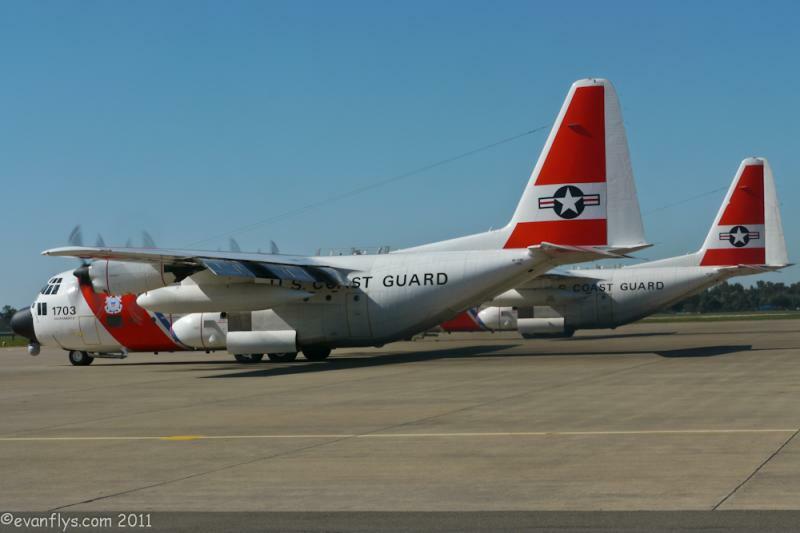 The C-130 has so much history and so much service and background. It's coll to be a part of it. It's been flying for so many decades and so many wars and campaigns and relief efforts and things like that but it's fun. 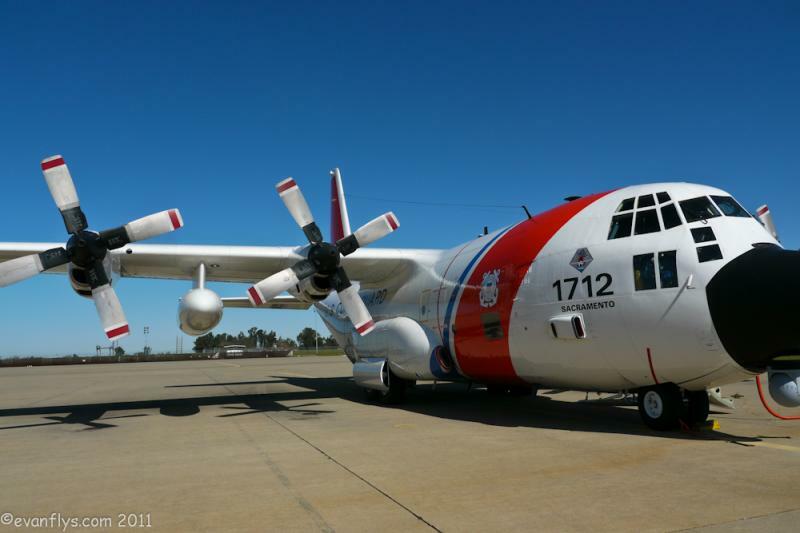 The Coast Guard gets to use the C-130 like nobody else does. We get down low over the water, as little as 50 feet over the water doing high angle bank turns and things like but that's all in the name of potentially saving other people's lives. We've been trained to save other people's lives. And just like what Matt said; the range is awesome. Helicopters are cool too, they hover low and hang out but have a limited range, and we go all over the place. We talked earlier about how Sacramento is the area of responsibility and it has a huge portion of the Pacific Ocean over the west coast to Central America so it's pretty neat to travel and be a part of missions that go in such a wide area. 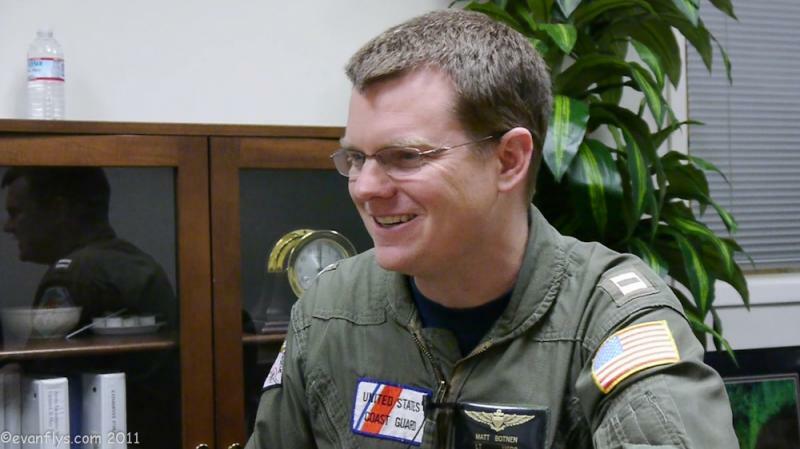 Matt: Like what Kevin brought up, the C-130 has been around so long that it's a neat little fraternity to belong to. You'll be here at the base and it's lunchtime and if I decide to go to Burger King right over there at the exchange I might run into some retired individuals and if I'm wearing my flight suit and go over there it's guaranteed that some retired gentleman is going to come up to me and say, “So you're stationed here at McClellan and the Coast Guard out there with the C-130's and I'll say “Yes sir” and they'll say “Oh I flew the C-130 the first time back in 1960” and tell a story about the C-130 and himself and I can't go anywhere. If I wear a C-130 T-shirt I'm going to get stopped by tons of people. 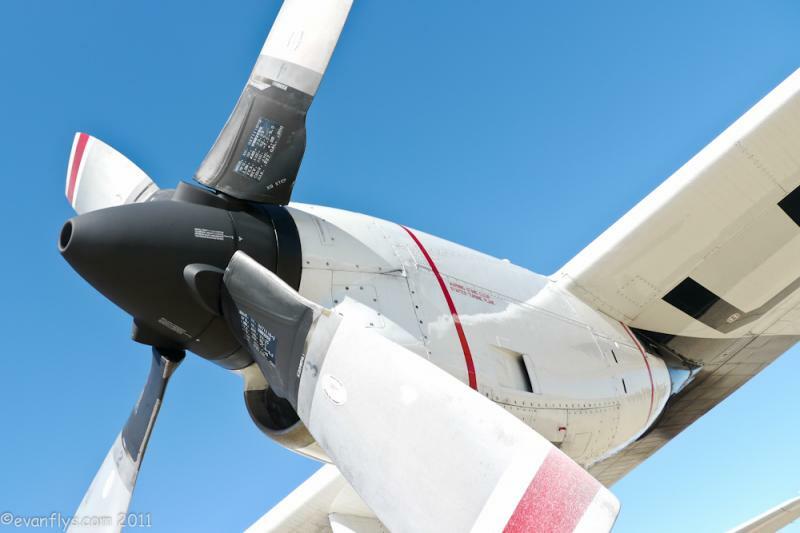 It's one of the most widely recognized airplanes in the world. It's kinda cool like when I first was flying in the Army I was flying the Huey for the first five years that I was in the Army and I couldn't go anywhere without running into Huey pilots and with the C-130 it's nice to get back in an airplane that has that kind of heritage again. Meanwhile all the other aircraft are in a holding pattern, waiting for their chance to get in. So, this guy loosing us basically put us, meant we jumped the line to get into Haiti, but he cleared us to land from 10,000 feet, which is not a normal landing profile for us! Normally we'll make a smooth descent, configure the landing gear and the flaps, do the brief and everything's good to go. But this was our quick window to get in there and drop these people off and to rescue people out of there. So we say roger, clear to land. We dropped our gear, flaps out to 100% and basically did this giant spiraling down from directly over the airport at 10,000 feet. It's a common thing we do, a max descent, I'm looking down straight at the runway, hanging from my shoulder straps in this giant plane, and all these poor people in the back and I imagine they've got to be freaking out after their experience the day before. We were coming in at an extremely steep glide slope and the aircraft commander and pilot we have here flared it at just the right time to beautiful perfect smooth touchdown. We got the people offloaded into Haiti and then we picked up I think 50 citizens of Haiti, evacuated them and came home. That was a long day but it was pretty exciting to rescue those people and bring those rescuers in. Matt: I was up in Kodiak Alaska, it was actually my birthday, and I was on duty that night and I was feeling all cool because it was my birthday and everything. I get in the plane, this was in the HH-60 Jayhawk helicopter, so I get in the plane and we are just spooling up and just getting ready to do an evening trainer, and just as the plane is pulling up to a hover, we get a call over the radio. There is a SAR case going on in Cordova and we need you to go out there and take care of this. So we already airborne so we'll get the brief on the radio as we go. We just take off and start heading that way. It's about two hours to get there from Kodiak to Cordova and while heading that way we start finding out that what's happened is a goat hunter is out at a peak about 2000- 2500 feet high or so and fell down about 500 feet and was up against the mountainside. He had someone there with him trying to keep him covered but he was severely injured it had all kinds of things that was wrong with him at that point. It had happened way earlier in the day. It was a interesting story how we even found out he was hurt when one of his hunting party members there was a big flood that had just happened and so does guide getting from the top of the mountain down below, commandeered a boat, took that across, hiked over everything in the world just trying to get to the point where he could flag down someone and could get communications to people to know that there was an incident that happened which is a whole other story that was really interesting. But again this thing happened around noon or something and eight at night is when we're finding out that something happened. So we get there and the weather is typical coastal crud. The mountain top where this guy supposedly is, is up in the clouds and its night of course at this point. We are wearing night vision goggles and we're poking around the top of this mountain just trying to find anything and we can't find him. We can't get up in there so eventually we need to land to get fuel. We land in Cordova where we're getting gas. At this point the state troopers bring the reporting source, the guy that had hiked his way down to report it. So we tell him to climb on in, we'll take you on up so you can help us find him. So he climbs in the helicopter with us and he's pointing where he should be up in the mountains but we can't see through clouds at all. Eventually we are back in Cordova and the clouds lifted just enough that we can see a flashlight under the night vision goggles through the fog from the top of that mountain. The flashlight is going and you can see the clouds literally just above that line. We said so this is our chance let's go get him. We race on over there, get right above, and sure enough clinging to this little crevasse is two individuals one that's covered in a poncho kind of looking thing in the other guy trying to hold him down and keep him warm. So we pull out into a hover next to it and commence with the cliff rescue, which is something I have been trained to do a lot when I was stationed in Astoria, which is where the actual cliff rescue school is for the Coast Guard. So I've done a lot of training there. Turns out the guys in the back there had not gone through that school and didn't know what to do. So it took a lot of on the spot training as far as how we're going to knock this out and get it done. We got the rescue swimmer down and he starts packaging the patient, getting ready to get him out, and about this time, I don't know if it was just the nature of the weather or the rotor system or what the deal was, but all the clouds suddenly sucked back down on top of us. So the swimmer is out there and I'm looking at everything through the goggles and everything I was seeing to make it so I wasn't smashing into the mountainside, which is just a few feet away from my rotor system disappeared. All I can see is green now. I looked under my goggles for a second and I could use my searchlight and I could make out a rock. That was the only thing that had enough contrast, just right at my window, that I could see. I said well that's enough so I just raised my head back under the goggles and now I'm staring at that rock and the whole time I'm just hoping I don't lose sight of that rock because sometimes there's looking at a single point, weird things can happen to your sight spatially. You can kind of lose track of where you are in space. You usually need at least another something else to put everything into perspective. So I was just looking at that stupid rock, I was able to hold it there thankfully. The whole time I'm talking over to the guy next to me and he said he has the rest of the area because we're kind of in this bowl. In front of us was a mountain, to the side of us was a mountain, to the left of us was the mountain, and the only way out is the way we came in, so we are just making sure he can see these mountains to the left and in front of us so that when it's all good we can get out of there! He's like yeah every things in sight, everything is good, and I'm like okay! Eventually we got both the guys that were on the mountainside in the back and the swimmer's in the back and they close the door to a lot of hooting and hollering in the back, and that kind of thing. I'm saying cool that guys because were not out of this yet. I'm sitting there thinking what are we going to do. Well, let's just back the helicopter up along the mountainside, hopefully I can pick up things on the way as we tell and be able to get us enough backwards that we can peel off sideways and be able to exit the situation. So I start trying to make our way backwards as slowly as I can and sometimes we're completely losing sight of things that I have to bring it closer where now I can see something, right about that time I see that the blades are really close to the mountain and the guys in the back as they would then be able to see at the same time and he would be very alerted me to it. “Sir, you've only got five foot rotor clearance!” So I try to pull it back to give us more room and we'd lose everything. The time it took to move it back like that was kind of nerve-racking. Finally we reached the point where we were back far enough to and at the same time I was basically losing the mountain. I didn't have enough contrast to see anything. I would get in close enough to try it just at that moment see that the blades are way too close to the mountains, so I peeled it back off and then I couldn't see anything. Alright this is it and that's when I pre-briefed with the pilot I was flying with that when it came to the fly-out, he had. He had himself locked down on the instruments basically do an instrument takeoff from the hover. So I just put us in a left bank away from the mountain and he took it into the instrument scan and a climbing left turn out of there. Neither of us could see anything we knew, we are surrounded by mountains, and we were basically just hyperventilating hoping that good things would happen as we punched out of the top of the clouds and could see finally. We got ourselves back around into Cordova and Life Flight was waiting so we handed the patient off to Life Flight and back to Anchorage and the guy ended up living so we saved his life in a time if we hadn't gone in there he definitely would've perished because there was no other game in town. So that was probably my scariest night. You have to be careful sometimes but yes that was an interesting night at the end of it we were all very excited that we had that opportunity to save the life and it was a good time that way but definitely was the scariest flight I've ever been on. It was interesting that within three weeks of that case is when a message came out that for the first time in many years they were soliciting helicopter pilots to switch to the C-130, and that's when I thought “hum, maybe I will do that!” I've been flying helicopters for a long time now and maybe that would be something interesting to try. Of course when I put in the paperwork I thought, well most Coast Guard pilots have gone to Navy flight school and flown airplanes and helicopters and all kinds of different things. Me being an ex-Army guy, all I've ever flown is helicopters so I was like they'll never take me to be a Herc guy anyway but I might as well put my name in the hat. They ended up picking me. I had a fantastic time getting to tour the station with these great guys. 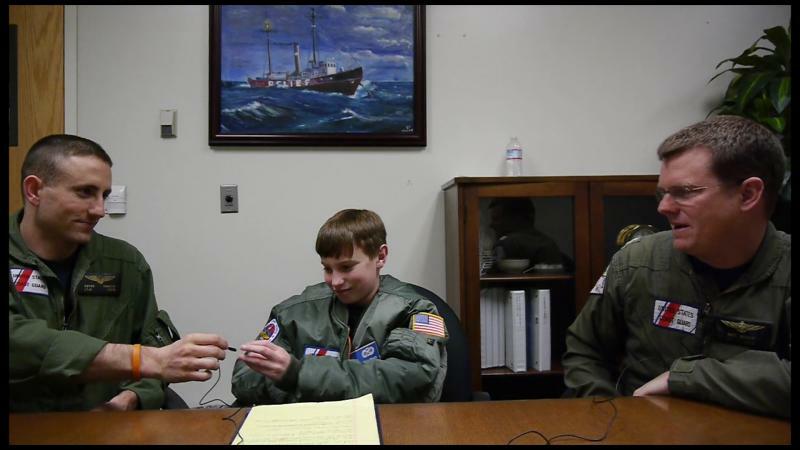 Lt Botnen and LTJG Hanson were great to hang out with and really fun to interview.